Most of the Ebooks offered here also have extra Bonus items included- so they really are a Great Deal! 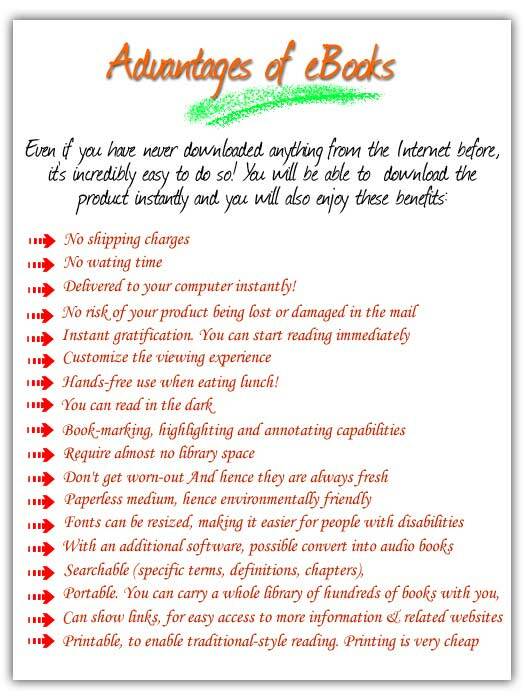 The reason that I feel offering ebooks is important is because they offer alot of helpful information. If you are considering a home or garden project, these books are what you need to get specific details on the projects. The list of ebooks offered on this site will grow and change, so keep checking it out for the latest additions. I do get a commission if you purchase the books through this site so I want to Thank You for shopping with me. As the pages of ebooks ok this site grow, This will become the place to visit if you are looking for a specific book on this site. So far there are 5 main pages for ebooks. There are some ebooks located on other pages on the site. They are related to the specific page they are placed on. Those links will be placed at the bottom of this page. Enjoy reading the ebooks offered here at Improve-Your-Home-And-Garden.com and remember knowledge is power! The links are below, Happy Reading! Books for Home Page will feature ebooks that are strictly for the Home. Home and Garden Books page covers specific ebooks on home and garden related topics. GARDENING- Food, Herbs, Flowers and More! Crafts and Hobby Books page offers ebooks on related topics of Crafts and Hobbies. Money Making Books - This page is all about Starting Your Own Business doing something you enjoy doing. The focus is on Craft and Hobbies that can turn into a profitable business. There are also service type business too. GARDENING, Growing Plants of all Types! Fab Jobs Guides The latest addition to the ebook directory is the Fab Jobs guides. These guides are a geat way to get information of a career field. These Fab Jobs guides are offered on this site to give you an opportuntity to improve your life by working for yourself. You will discover that there are over 100 different Fab Job Guides to choose from. Get started on you way to working at a job you are passionate about by visting this page. BUT WAIT- THERE 'S MORE! There are ebooks placed on pages that are in the same subject matter as the featured ebook. Look these pages over, as theyhave lots of ideas and tips on the same subject as the ebook. Antiques Find it and Fix it! If you enjoy reading and learning new things, Consider getting a SBI Membership. SBI is a wealth of knowledge and offers lots of free ebooks that are very useful with an SBI Web Business. This Site is an SBI site. I get to work from home doing what I love to do. If that sounds like something you might be interested in, give it a try...I am glad I did. GET A JOB YOU LOVE, WORK FOR YOURSELF!